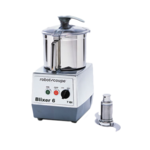 Food processors and blenders are not one in the same, as blenders require some sort of liquid to keep food moving through the blades. Food processors, on the other hand, have a flat bottom and thus do not need additional liquid. Capacity: typically between 1-6 quarts, although some industrial units may come in larger sizes. Typically features a Sebatier or ‘S’ blade, and the bowl is detachable. Bowls typically made of plastic with some stainless steel. Primary Task: chopping, kneading, pureeing, grating, slicing, shredding. Capacity: continuous feed allows for limitless capacity. 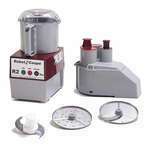 Dispenses food into a separate container, allowing for quick preparation. Capacity: can be continuous or will be limited by the bowl size you opt for with batch capabilities. 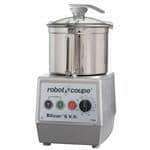 Uses both a bowl and continuous feed capabilities depending on whether or not you utilize an add-on unit. Primary Task: multi-tasking abilities of both batch bowls and continuous feed processors through the use of interchangeable heads. Built to save space with removable bowl and tilting seal. Primary Task: meat processing, grinding, kneading, emulsifying, mixing. Capacity: a wide range of capacities from 2 to 60 quarts. Primary Task: pureeing, mixing/ blending liquids. Capacity:bowls ranging from 5-15lbs. capacity. 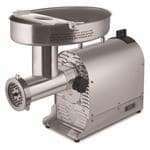 Utilizes a rotating 14” or 18” s/s bowl to mince items via a multi-bladed, vertically-revolving knife at the rear of the bowl. Primary Task: mincing meats, blending and emulsifying proteins, chop vegetables. 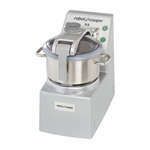 Operates as a mixer hub attachment designed specifically for vegetable slicing capabilities. Can either connect to a 12 or 24 sized hub and will need to be verified prior to purchase. Hub Attachment: continuous feed allows for limitless capacity but with a slower output. 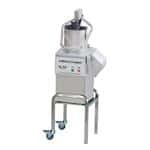 Stand-Alone Unit: continuous feed best for high-volume meat grinding outputs. 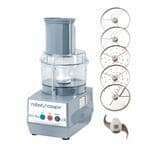 Operates as a mixer hub attachment designed specifically to grind meat. Available as a hub attachment and can either connect to a 12 or 24 sized hub. Can also be purchased as a stand-alone unit. Make sure to choose a processor that also comes with (or has available for purchase) blades and discs to tend to all of your processing needs. 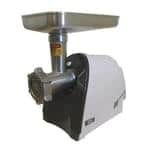 Some may only have a few attachments available while others may include a wide range of blades and discs to tend to almost any food processing need. Typically not ideal for restaurant use, these are reserved for small batches and softer foods. Liquid ingredients require about half the capacity for the processor. 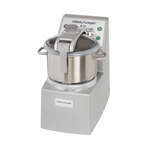 Best for small batches of sauce, blending/chopping herbs, chopping nuts, liquid ingredients, garnishes. Best for restaurants, hospitality, and institutions. For large-volume outputs, consider the continuous feed processor. And best for cheeses, bulk veggies and batch salsas. Size also comes into play in regards to the chute, which is your main alley for adding ingredients into the main cavity. 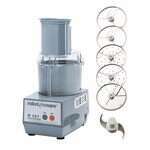 A good rule of thumb is that for food processors of 9 quarts or higher, opt for at least a 600 horsepower rating. Hoppers, bowls, and pushers may be available as well as different choppers and discs. Included with your purchase of a batch bowl, the ‘S’ blade sits at the bottom of the bowl and combines ingredients together. Positioned at the top of the bowl and slices food into different shapes and slices. These are best for visible foods, as the presentation is key. Best for sandwich pickles, mushrooms for pizza, curled chocolate or cheese slices. Holds food before it’s funneled into the cavity of the processor. Helps to push food through the opening and into the cavity. This keeps fingers safe and acts as a lid. Is the receiving container for food as it’s cut. Best for choose size based on the input. 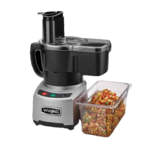 Shop our extensive line of food processors at CKitchen.